Hey y'all and Happy Friday! I hope you all had a wonderful Thanksgiving yesterday! I did get most of my shopping done yesterday, especially for my nieces and nephews. I'm the aunt that gets everyone new pajamas for Christmas every single year. It's so hard to stay up to date on what everyone has and what they are currently into so pajamas are just the way to go, especially when you are buying for 13 children! Today, we are on our way to South Carolina for a post-Thanksgiving weekend with my husband's dad. I'm excited for even more great food and fun! I'm rounding up eight items that I am currently loving. While you're getting your Christmas shopping done, be sure to treat yourself to something cozy! 1. White Sweater | I tried this sweater on in the store the other day and I absolutely love it! I'll be adding this one to my shopping cart. I love the details! I personally will size up one size to wear it with leggings because a sweater you can wear with leggings is my favorite! 2. Blush Scarf | I own this scarf and I love it! It's seriously so soft and warm without being suffocating, lol. I also love this blush pink color! 3. Classic Heels | A few weeks ago, I was getting ready to attend a wedding and I realized that I didn't own a classic pair of black heels. I will be fixing that problem with this gorgeous pair of heels. They are so classic and super comfortable! They run true to size. 4. 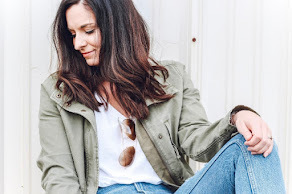 Frayed Hem Jeans | This is my current favorite pair of jeans! I love the frayed hemline and the comfortable fit. The sizing is true to size. 5. Chenille Sweater | This sweater is also on it's way to my shopping cart! I have been looking for the perfect pink pullover chenille sweater and this one is definitely it. I have been loving all things chenille this season! 6. Faux Fur Coat | This beautiful coat is less than $40 and I love the color! It's not really something I would typically pick but I was drawn to it when I saw it in the store. The faux fur is super soft! 7. Pom Pom Hat | Every woman needs a cozy pom pom hat for the winter season. This would also make a great gift for a friend at under $8! 8. Embellished Cardigan | Give me all of the cardigans! I love this because of the embellished details and you can just never go wrong with a gray cardigan! I plan to get this for myself as soon as possible. Thank you so much for visiting! I hope you have a wonderful weekend!